Gene Black an Alabama Artist and Quilter: A Happy Quilt- Finished! 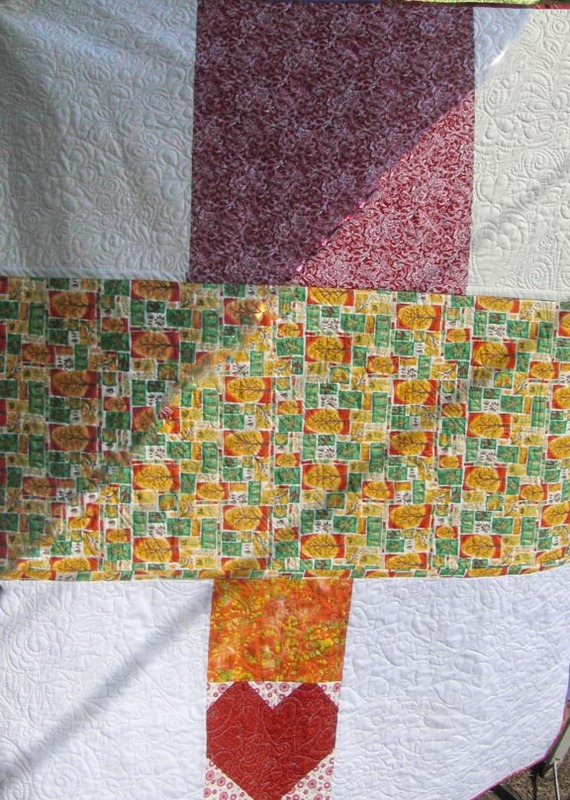 This quilt has been a while in the making, but I should get it turned in by the deadline. I have shown parts of the top before so it may look familiar. I am happy to say that it is finished except for the labeling. I am still trying to determine what they want on the quilt label. 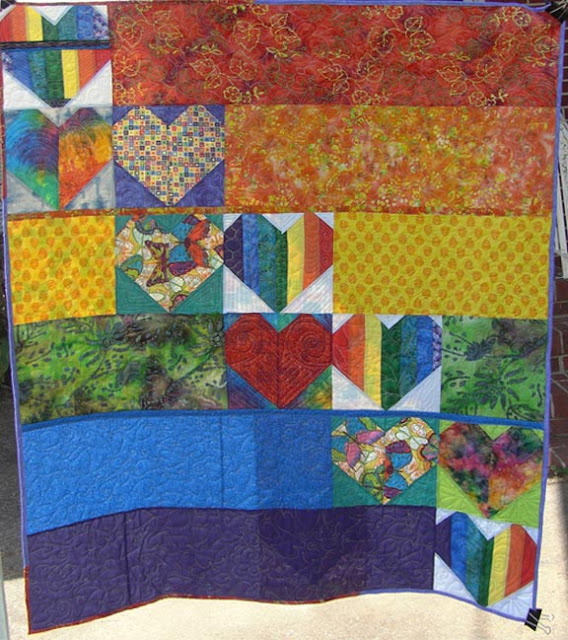 The front is bright and happy with hearts and rainbows of vivid color. The wind decided to blow as soon as I started to take a photo - hence the binder clip on the lower right corner. I used the binder clip to weight it down a little. The back is simpler and a bit scrappy. I had one heart left over and it is on the back along with some other fabrics cobbled together for a scrappy backing. The top left of the picture had a very strong shadow on it. So some photo editing was done and you may see some "odd bits" where the shadow meets the sunlight. I hope this quilt goes to someone who truly loves and cherishes it. This is so eye catching. Simple design with great use of color. it will be so loved. As always, colorful...and that does translate to happy! So sweet. Hearts to warm someone's heart. Great job!!! Love, love, love it!! Hope you stay safe in the storm!! Really nice quilt Gene, and for a great cause. Gene: It is a beautiful quilt. Thank-you for the learning links.